Frances Lee Crall Patton, daughter of Walter Scott and Effie May Arnold Crall, was born, April 24, 1944 in Camdenton, Missouri. She departed this life, March 16, 2019, in her home, Camdenton, Missouri at the age of seventy-four years, ten months and twenty days. She was preceded in death by her parents, five sisters, Betty Crall, Eathel Crall, Ella Faye Webster, Della Mae Ashbaugh and Helen Estes, and four brothers, Iralee Crall, Arvel Crall, Ernie Crall, and Mallard Crall. She is survived by her husband, James Thomas Patton of Camdenton, Missouri,; son, Jimmy Lee Patton of Camdenton, Missouri,; daughter, Crystal Kay Lloyd and husband Michael Richard of Camdenton, Missouri,; two granddaughters, Stella LeAnne Lloyd and Adelynn Shae Lloyd of Camdenton, Missouri,; one grandson, Mitchell Lee Patton of Osage Beach, Missouri,; brother, Robert Joe Crall and wife Dee of Kaiser, Missouri,; and a host of nieces, nephews, other relatives and many friends. Frances was raised in Camdenton and attended the Camdenton Schools. 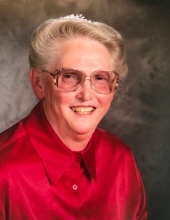 Frances made a profession of faith and was a devoted member of Harvest Tabernacle in Lebanon, Missouri. In her spare time she enjoyed tending to her flowers in her garden and taking care of the yard. Loved to feed the deer and turkey in her back yard. You would never leave her house hungry because she would cook enough for an army. Most of all she loved taking care of her family and spending time with her family and grandchildren. She was a loving wife, mother, grandmother, sister and a caring neighbor and friend. We celebrate her life and her accomplishments and will treasure the memories she created for her family and friends. To send flowers or a remembrance gift to the family of Frances Lee Patton, please visit our Tribute Store. "Email Address" would like to share the life celebration of Frances Lee Patton. Click on the "link" to go to share a favorite memory or leave a condolence message for the family.